Tennessee knocked off No. 15 Butler, 67-55, to give the Bulldogs their second loss of the season – their only other blemish came at the hands of No. 16 Oklahoma. With the victory, the Vols moved to 3-0 at home this season and 4-3 on the year. Josh Richardson, Kevin Punter, Devon Baulkman, Armani Moore and Willie Carmichael III started the game against Butler. The Vols have now used six different starting lineups in seven games this season. Here are five takeaways from the big Vol victory. 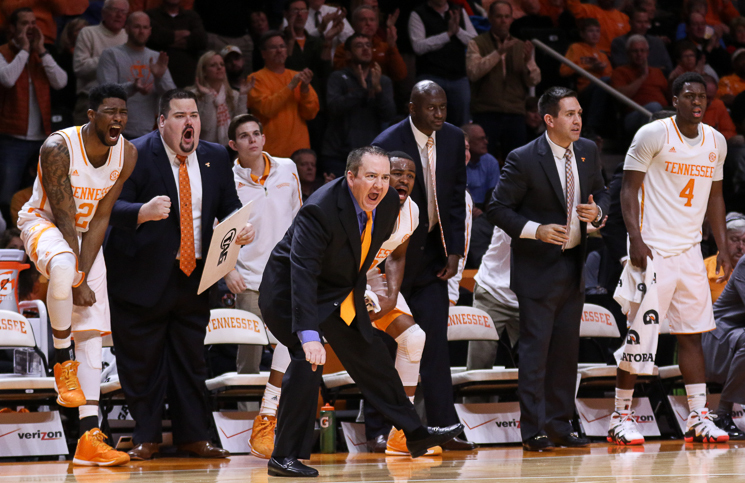 Vols Finish Strong: Last weekend against Kansas State, the Vols faltered down the stretch. Tennessee entered the final minute of play with a 10-point lead only to scrape by with a one-point win. Sunday’s victory over Butler told a different story – the Vols played their best ball late in the game. Tennessee grabbed a 50-49 lead with 6:17 to play – their first lead of the second half. The Vols built that to a 56-51 advantage at the 3:21 mark. Butler’s Andrew Chrabascz connected from deep with 2:43 to play to cut the lead to 58-55 – the Bulldogs wouldn’t score again. Tennessee ended the game on 9-0 run to preserve the victory. Kevin Punter Explodes, Richardson Shines: Junior guard Kevin Punter turned in a career day with 18 points on 7-10 shooting. His previous career high was 14 points against Kansas. Punter added four rebounds and had just one turnover in 32 minutes of play. Josh Richardson led all scorers with 20 points (9-13 shooting) and recorded a career high six steals. Richardson also added three assists, three rebounds and zero turnovers in 37 minutes on the court. He’s playing at an All-SEC level so far this season. Richardson was the best player on the floor against Butler and Kevin Punter wasn’t far behind him. When Punter and Richardson play at that level, the Vols will be a very, very tough matchup for nearly everyone on their schedule. Vols Win Turnover Battle: Butler entered the game ranked 5th nationally in turnover margin (+5.9 per game). Tennessee forced 14 Butler turnovers while turning it over just seven times – a +7 margin in favor of UT. The Vols outpaced Butler by a 19-5 margin in points off turnovers. Those twelve points equal the margin of victory for Tennessee. Free Throw Improvement: Tennessee had been outscored at the charity stripe by 36 points this season entering Sunday’s game. Conversely, Butler ranked 30th in the nation in free throw attempts. The Vols outscored Butler 14-9 at the free throw line and tied a season low with 19 fouls committed. After being outscored at the free throw line in each of their previous five games, the Vols have now outscored their last two opponents at the line. Aggressiveness Pays Off for the Vols: The Bulldogs entered the game as one of the more efficient teams in the country on both ends of the floor – ranking 11th in defensive efficiency and 89th in offensive efficiency. Those numbers didn’t matter against the Vols. A stifling and energetic Tennessee defense held Butler to 33.3% shooting from the floor. Tennessee attacked the basket on offense, which led to UT shooting 50% from the floor. Punter was 6-7 from 2-point range and Josh Richardson did not attempt a 3-point shot. Utilizing their athleticism across the board by attacking the hoop and not falling in love with the 3-point shot was huge for Tennessee against Butler. Next up, Tennessee travels to NC State (7-1) – Wednesday, Dec. 17, at at 7 p.m. ET (TV: ESPN2) – for their first true road game of the season.